There are twelve signs in the Shēngxiào or Chinese zodiac, each linked to an animal. The Rat is the first animal in the cycle and it is followed by the Ox, Tiger, Rabbit, Dragon, Snake, Horse, Goat, Monkey, Rooster, Dog and Pig in that order. There is a story about how this originated. Buddha summoned all the animals to come before him before he left earth but only twelve actually turned up to bid him farewell. To reward those who had come to honour him, Buddha named a year after each of them. The years were given to them in the order they had arrived. I was born in the Year of the Rooster and supposedly share many similarities in behavior, temperament, attributes and attitudes with that creature. According to almost every Chinese Horoscope, people born in the year of the rooster are very observant, hardworking, resourceful, courageous, confident, persistent and talented but they like to be the center of attention and always appear attractive and beautiful. Their continually seeking the unwavering attention of others annoys people around them. A few days ago, I rented a room in a cabana on the grounds of the Crown Point Beach Hotel in Tobago. As I walked to my room I once again admired the fantastic view of Store Bay, one of the best beaches in the Caribbean. It brought back many memories of all my visits to Tobago over more than fifty years. My cousins Brenda and Indra, and Indra’s granddaughter Chloe, walked along with me and Chloe stopped to play with the many little chickens around. I jokingly thought that right now they’re in the yard but in a few months they will be on the dinner menu. 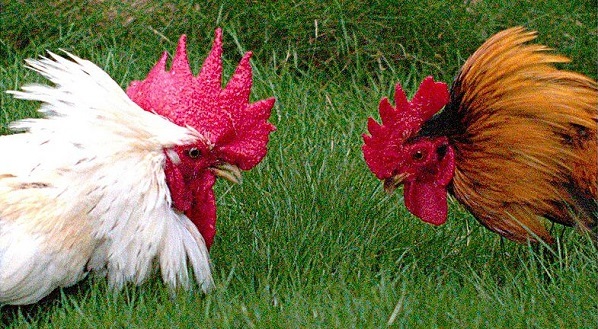 Despite being born in the year of the Rooster and supposedly observant, I failed to make the connection between the presence of the chickens and their procreation. That proved to be a major mistake. The second was to stay up late working on my computer and finally falling asleep at about one in the morning. “Early to bed and early to rise, makes a rooster healthy, wealthy and wise.” He woke at three in the morning and being a good Buddhist believed that his sacred calling was to announce his presence to the world. This way he could also achieve his major life goal of being the centre of attention. He did it with gusto and an annoying regularity displaying the persistence that roosters are famous for. In my youth, we had chicken only on Sundays. Almost everyone “mined fowl” and a designated member of the family had the job of dispatching the designated bird and preparing it for lunch in the designated large cooking pot. Some used a knife and some wrung its neck. Perhaps because it was Sunday, the ancient urge returned with a vengeance and I was tempted to dash outside, seek out the offending creature, and send its soul right back to the Buddha. In terms of its body, my little cabana had a stove and a large enough pot. Unfortunately for me and fortunately for the rooster, my life-style has changed. My chicken consumption is no longer restricted to Sundays only, and even though I continue to be the only child in my family, the chicken comes covered in cellophane and straight from the super-market freezer ready for conversion into “kung pao” or the favourite meal of that late, great Chinese military hero, General Tso. In fact I kept cursing the Tso and Tso rooster and promised him that instead of chow mein he will be my main chow. When Sunday morning dawned and the rooster continued to crow, perhaps celebrating his triumph over me, I stumbled into the morning light bleary-eyed only to see the little chicks and their mothers, as well as a bunch of brown doves, desperately foraging for food. I had a “sub” (bread or what we called in the old days “butter” loaf) destined for a cheese sandwich in the fridge. Realizing that it might be the appropriate meal for the marine environment, I broke the loaf into bits and bites and threw it for the birds. This was my good deed for the day and would please both the Buddha and Saint Francis of Assisi. Even more birds joined the fray and sometimes they even pecked a bit of bread instead of one another. I supposed the rooster must have seen the gathering crowd and after exclaiming, “What the flock is that?” rushed out, grabbed some bread and crammed it down his gizzard (a part of the chicken which I found repulsive but was forced to eat when I was young). Mr. Rooster then made a beeline for the nearest hen, had his way with her and set off in pursuit of another. I immediately wondered what was in the bread that prompted such behavior but only my natural decorum stopped me from running outside and salvaging the bits of my bread still uneaten to see whether there were long-term commercial pharmaceutical prospects in replicating the bread recipe or even other pleasurable short-term benefits. Later that day I went to Louis D’Or to watch a cricket match which started at nine-thirty and required an hour’s drive from Scarborough. The road has more twists and turns than Agatha Christie’s novel “The Murder of Roger Ackroyd” which was recently voted the best “whodunit” or crime story ever. Around eleven a.m., as I just began to enjoy the somnolent Sunday – cricket on the luscious green grass, the whole feeling of languor induced by the beautiful rural setting, listening to the DJ on the hill playing Shadow’s “Ease The Tension” between overs, a rooster started up raucously reveling in his lung power. It was clear to me that he was out partying on the Saturday night, something that is a Tobago tradition, and had just woken up with a serious hangover. It was not a pleasant sound especially as it went on and on. My primitive self was ready to take action, possibly with a machete, but then the Buddhist in me took over and I went into meditative mode and kept seeking enlightenment in the midst of temptation. St Francis, or even Pope Francis would have been proud of me. I came up with a Koan or Zen Buddhist paradox on which to meditate. Does the hatching of a rooster make that particular period of three-hundred-and-sixty-five days starting in January, the year of the rooster? If a rooster is also born in the year of the rooster, is that reason to crow? Eventually, I wished peace unto my brother roosters until the next morning, at just about four, his other brother shattered mine again. *Tony Deyal, having changed his mind, was last seen hunting breadcrumbs in the grass outside his cabana.